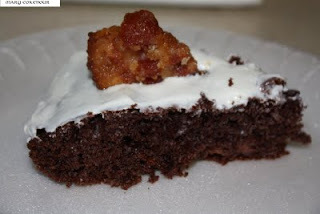 Food Adventures of a Comfort Cook: Bacon - it's "what's for dessert?" Bacon - it's "what's for dessert?" Bacon, whether it is flavored with maple or honey, seasoned with hickory or apple wood, bacon is yummy goodness and ups the anty on taste for anything it is included in, even dessert. That's right, I said bacon for dessert; even I had my doubts about trying out dessert recipes with bacon in it, but I had to try nonetheless. 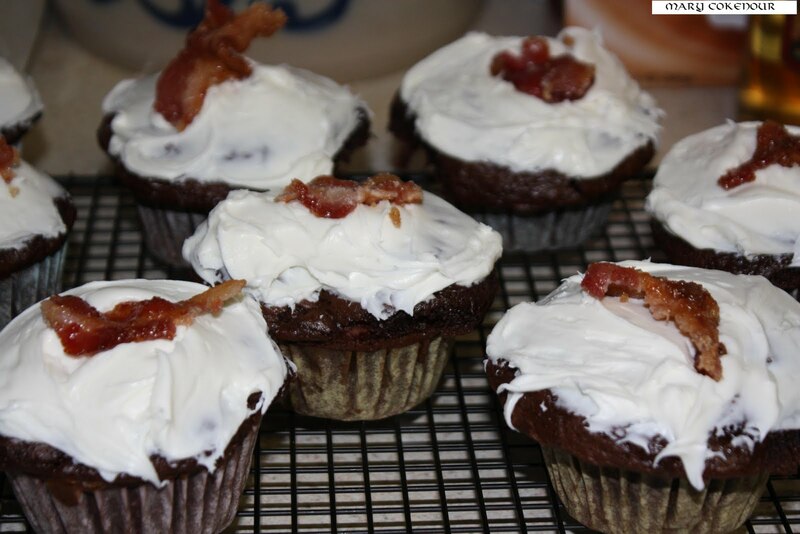 I'd seen bacon cupcakes on a few shows featured on Food Network, and one of the ladies at a local bank told me about a site that had a recipe for candied bacon. 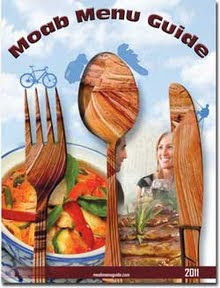 Well I couldn't remember the name she had given me, so decided to search the net for recipes, and I cannot believe how many hundreds of bacon dessert recipes I found. Which one to choose was a total mystery, so I printed out a few, compared notes, and came up with my own concoctions. Now Roy was not happy about the whole experiment thing at all...bacon is bacon and shouldn't be made into candy or cake. He still doesn't like the idea of it all, but he did have to agree that my recipes came out pretty well, and he was impressed at my accomplishment. I likened the taste to French toast in syrup, but without the bread; and it was the perfect garnish for the cupcakes. 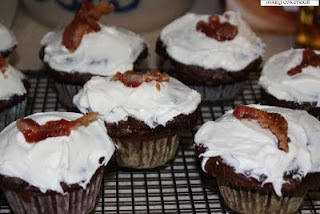 Then came the cupcakes, the fat from the bacon gives the cake a moister and richer consistency. The meat of the bacon does cook during the baking process, and it is like a little chewy surprise within the cake...think bacon gummy bear. 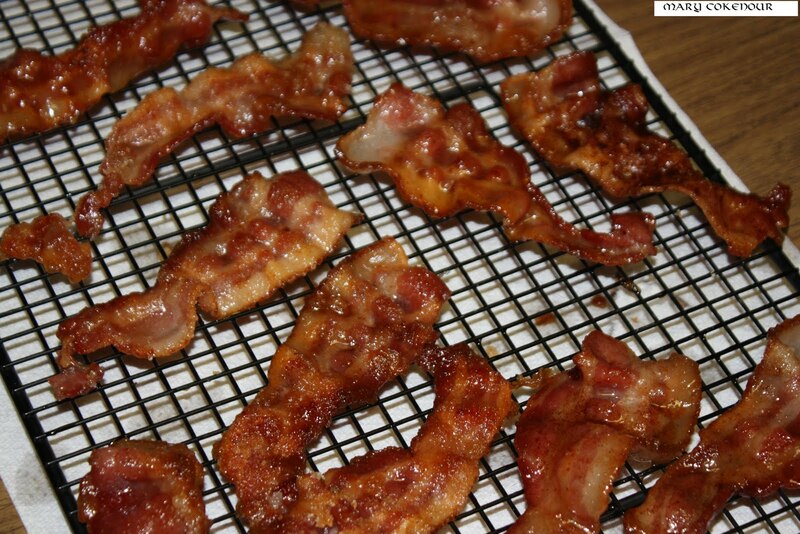 There is not an overpowering taste of bacon, you know it's there, but it all comes together well. Makes enough for 12 - 16 cupcakes depending upon how much is spread on each cupcake. To make enough to cover the top, sides and in-between 2-8 inch cakes, double the recipe. I'm not a big dessert person but this could change that for sure! Love it! Thank you Julie! and most especially for becoming a follower for I appreciate every one.